Statistics from the Centers Disease Control and Prevention tell us that 1 out of 4 Americans over the age of 65 will fall during just about any given year. Whether in a supermarket, on a sidewalk, in the workplace, or at home, these falls can easily cause serious injuries like broken bones, fractured spines or traumatic brain injuries. In this issue, we’ll share tips from the American Council on Science and Health that will help you avoid fractures and other injuries if you feel yourself about to fall. Is it just people 65 and older who are more susceptible to falls? Hardly. In fact, those between the ages of 50 and 60 experience an even greater frequency of falls since they tend to be more active than seniors 65 and older. That’s according to a study from the Journal of Allied Health. How can I prepare myself before I fall? There is an artform to falling in a safe way, and a professional stuntwoman shared her techniques for absorbing serious spills in a recent interview published on the AARP website. The main thing, she said, is to avoid being rigid when you sense you’re about to fall. To protect your head, tuck your chin to your chest – especially if you sense yourself falling back so that your head doesn’t hit the ground. To keep fragile areas like your hips from having to absorb a blow, bend your knees and your elbows to increase the chances of falling either on your side or backside, essentially turning yourself into a human ball. Your side and backside are better able to absorb the shock from a fall. In an effort to create a softer landing, tuck your shoulders in and try to push yourself forward through the initial fall. This spreads the impact over more areas of your body. If you experience a fall because of someone else’s negligence, call the Alaska slip-and-fall personal injury lawyers at Barber & Associates. 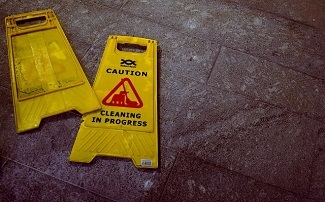 Slip-and-fall accidents can happen in a flash, but hopefully, the tips above will provide you with a bit of knowledge to help protect yourself. If experience injuries because of someone else, get in touch with us here at Barber & Associates. The first consultation is always free. Our number is 907-276-5858 or you can reach us via email.